Report from B.Playful 2002 | JONAH BRUCKER-COHEN, PH.D. Report from B.Playful 2002 – JONAH BRUCKER-COHEN, PH.D.
Held in the National Center for Popular Music (a failed music museum shaped like a giant congo drum) in the small town of Sheffield, the B.Playful forum was an event showcasing the potential of play in new media interface design and practice. The event featured a wide array of speakers both in the commercial and digital arts-based creative realms that attempted to uncover why play is a key element in the production, distribution, and creative process surrounding digital media. Beginning with keynote speaker, Jeff Jones, from the Creative Industries Research and Applications Center in Brisbane, Australia, the focus started with finding a common ground between industry funding models and creative production labs that allowed for R/D along with specified content delivery. The first panel, “Playing SMART”, featured Lizbeth Goodman (SmartLAB), Jacki Morie (USC), Gary McDarby (MLE), Brian Duffy (MLE) and Chris Bregler (CAT/NYU). Each presenter showed demos of their work that focused on how integrating playful interfaces such as bio-feedback, emotional storytelling, interactivity across disabilities, and robotic manifestations of social interaction into digital media outlets created meaningful experiences. Jacki Morie (Institute of Creative Technologies, USC) showed her work, “Memorystairs”, that looked at altering military-based simulations with emotional cues for soldiers deployed into the field in order to change their interaction with local communities and missions. Gary and Brian spoke about current MLE projects they are working on including Brian’s Social Robotics, and Gary’s approach that by allowing bio-feedback to control data-spaces we can begin to better understand our bodies and how we interact with computers through them. Another panel was “New Collaborative Opportunities”, which showcased technologies and work that enabled artists to collaborate online either through telematic performance or through web-based content creation platforms for streaming media. Adam Hyde of Radioqualia.net showed his “Frequency Clock” project (www.frequencyclock.net), an online tool that allows people to build “instant” streaming sites to display their content. Kelli Dipple, a performance artist, showed some telematic dance that was created through a net-based link between two cities. Derek Richards showed his “HyperJam” project which dealt with linking performers in a club space to visitors who could input their collective preferences into computers which then would be interpreted by the djs. 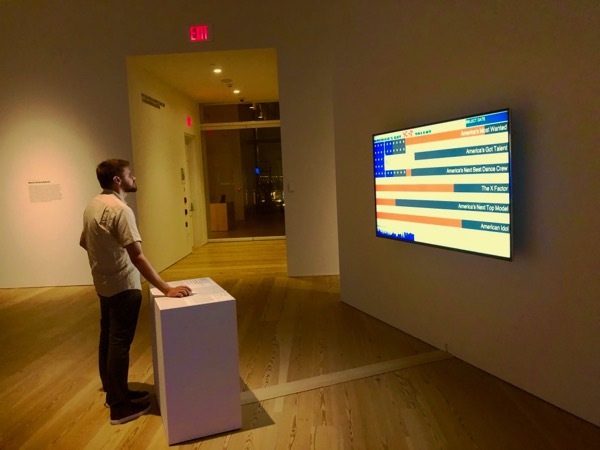 His future plans were to build an online poetry jam where writers could collaboratively contribute to new forms of expressive poetry in real-time. The “Humanizing the Digital” panel featured Ghislaine Boddington of Future Physical whose background in theater and dance took a body-centered approach to collaborative performance systems. Celia Pearce (Game Researcher at UC Irvine in Los Angeles), one of the conference’s most opinionated speakers, spoke about how games have begun to lose their authorship to their players. Her examples ranged from fans of the SIMS creating niche characters like “Goth Sims” to research by Edward Castronova who found that Norrath, the world in the online multi-player game “EverQuest”, has the 77th largest economy in the world. Her point was that as artists begin to question the very nature of existing digital systems, the rules of their creation and evolution change. I spoke on the “Network Topologies” panel along with Fee Plumley of The Phone Book (www.the-phone-book.com) and Giles Lane, of Proboscis. My talk, entitled “Physical Data Networks”, explored the possibilities of shifting the transparent nature of information networks into physical manifestations that exist on a human scale. I mentioned how my projects, “SpeakerPhone”, “MouseMiles”, and “StreamingMedia” attempt to give networked activity, in both the movement of data and the physical nature of data, new physical attributes. 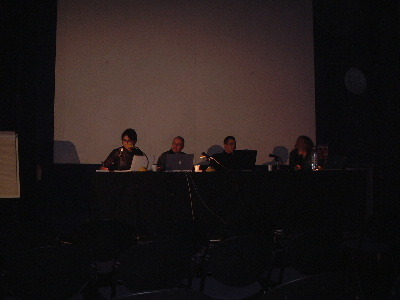 In all the conference provided interesting perspectives on multiple trajectories of creative practice in digital media. From turning bio-feedback into control mechanisms, to large-scale collaborative performance, to massive online gaming hacks, to augmenting military training exercises, the most compelling projects were the ones that gave a context for their existence. Gone are the days of creating interactive media for its own sake. Without context or applications for the work, the debate seems to remain fixated on why technological means are necessary in the first place. Conferences like B.Playful are important because they emphasize the need to question digital media before claiming it as an integral part of any project. This is something overlooked in most conferences I have attended.